The Colorado Avalanche needed one point. One point is all that separated them from back-to-back appearances in the Stanley Cup Playoffs. The Winnipeg Jets came to town hoping to squash those hopes. The Jets got off to a quick start, putting two goals in the back of the net in the first period. 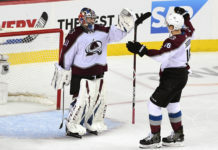 Colorado, maintaining their streak of resiliency, clawed their way back into the game with goals from Tyson Barrie in the second period and Carl Soderberg in the third. With 1:26 left in the game, Colorado took a too-many-men on the ice penalty. 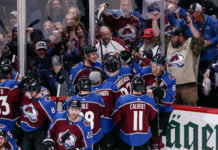 With blocked shots from Matt Calvert and Erik Johnson, the Avalanche sent the game into overtime, guaranteeing one point and clinching their playoff birth. After killing off the remaining 30 seconds on the penalty from regulation, Nathan MacKinnon picked up the puck at his own blueline and used his speed to turn the play into a 2-on-1 with Erik Johnson. 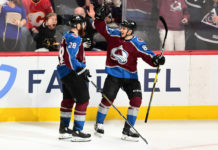 MacKinnon found Johnson, who buried his seventh goal of the season to give Colorado the 3-2 overtime win over the Winnipeg Jets. What did we learn from tonight’s playoff-clinching game? 1. This team doesn’t know the meaning of the word quit. Colorado came back from a 2-0 deficit, just as they did the past two games against Edmonton and St. Louis. Playoffs, and beyond, were the goal for this team and anything short of that was unacceptable. It showed tonight, as this team crawled their way back against a very good Jets team. 2. Grubauer brought this team to the playoffs. Yet again, Philipp Grubauer stood on his head for his team. He made 34 saves on Thursday night, making the big saves when needed. It is very obvious that goaltending is one of the biggest factors in winning games and Gurbauer added that element to the Avalanche tonight. 3. Tyson Barrie is a freak of nature. I’m joking. However, he is REALLY good at hockey. His goal tonight was one of his prettiest goals of the year. If you haven’t seen it yet, look below. With his goal, Barrie now has 14 goals and 59 points on the season. He is the third leading scorer for the Avalanche and the highest of any Colorado blueliner by over 25 points. Just like with Grubauer, Colorado would not be where they are after tonight without him. 4. Home ice is once again an advantage. Colorado is 21-14-6 at home this season. 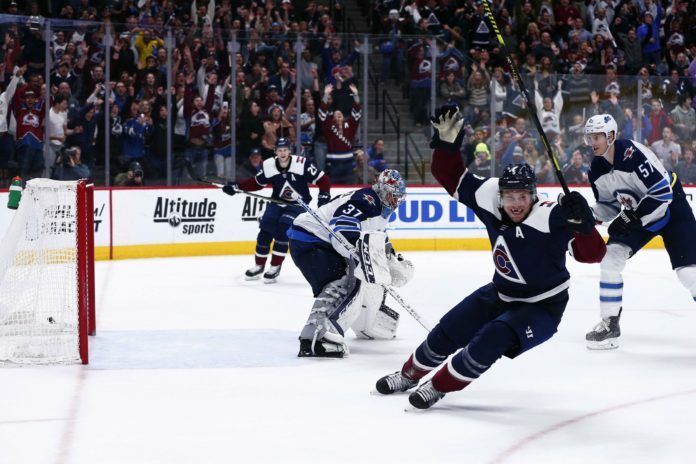 After having a miserable start on home ice, the Avalanche have figured out how to win at the Pepsi Center once again. They have won 9 of their last 10 games at home, dating back to February 27th. 5. Here it is again, THE COLORADO AVALANCHE CLINCHED A SPOT IN THE STANLEY CUP PLAYOFFS. This is the first time in nearly a decade the Avalanche have been in the playoffs in back-to-back years. They are going into the playoffs hot. The Colorado Avalanche return to action on Saturday for their final game of the season on the road against the San Jose Sharks. Puck drop is set for 8:30 PM MST from the SAP Center.